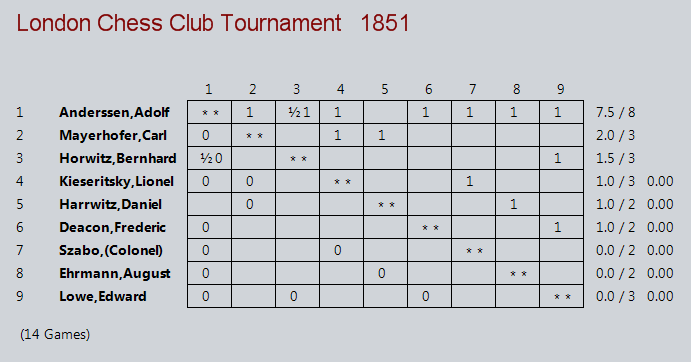 This tournament was a 9-player single-win Round Robin tournament sponsored by the London Chess Club for foreign players who remained in London after the completion of the more famous Staunton International Tournament held at St. Georges Chess Club. This was the first major tournament utilizing that format, predating the <London (1862)> tournament. It was held from Monday July 28, 1851 until Saturday August 16, 1851 (the exact ending date is somewhere between the 9th and 16th). 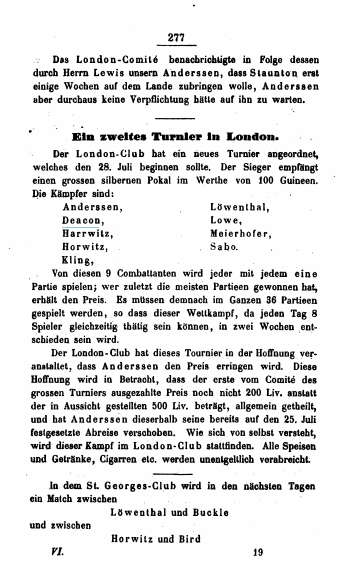 The tournament offered a single prize, a gold cup worth 100£ (actually 100 guineas), which was won by Anderssen. Mayerhofer is reported to have taken 2nd place. Early in the contest it became clear that Anderssen would emerge the winner, and several players are known to have dropped out without completing play. In fact, only 14 games are known to exist (of which 13 are available here, 11 from primary sources). Additionally, due to the friction between the two London clubs, the press coverage was limited – with little mention in any of Staunton’s reporting. Thus, the best coverage was in Horwitz and Kling’s The Chess Player, despite them often including scores without explicitly mentioning the source of the game. Luckily, Anderssen included all of his games in the Schachzeitung der Berliner, allowing additional confidence in Horwitz and Kling’s reporting. 3  4  5  6  7  8  9    <-- Anderssen finishes on 8th. 10 11 12 13 14 15 16    <-- End date not exact, probably on or before the 9th. Anderssen, Loewenthal, Harrwitz, Horwitz, Szabo, Kling, Deacon, Meyerhoffer, Loewe and several others. It can be seen that the definition of “foreign” was somewhat broad, as Horwitz and Kling, were well entrenched in London by that time. Loewenthal was yet to become the mainstream fixture of London chess that he was destined to becom, having come to London for Staunton’s tournament, and staying on in a position at St. George’s. Despite this reportage, neither Loewenthal nor Kling participated in the tournament, instead Ehrmann and Kieseritsky joined. Kieseritsky had actually returned to Paris after Staunton’s tournament, and agreed to return to London after being enjoined by Mr. Mongredien, president of the London CC. The tournament was fairly fast-paced by design. Many of the vistors to the City were due to depart soon after the main tournament. The members of the London Chess Club wanted to share in the opportunity presented by the visitation of so many chess experts from foreign lands and so designed the tournament to be a RR-1w partly out of necessity. As it was, Anderssen returned to the continent before the formal end of the tournament (though he was known to be the winner far ahead of the close of ceremonies). His victory Cup had to be mailed to him in Breslau! It’s also an unfortunate corollary of Anderssen’s fast-paced victory, and the offer of but one grand prize, that several other players withdrew from the tournament before finishing their schedule. Kieseritsky himself reported in his <La Régence> that he only played three games, a win over Szabo, an expected loss to Anderssen, and an unexpected lost to Mayerhofer. Mayerhofer was a Viennese player, much beloved in his home city (both for his chess skills, and for his operatic talent as singer). His second place finish was likely the high point of his chess career, even if the tournament itself was somewhat blemished by dropouts. Another player who exited early from the tournament was Harrwitz. His win over Ehrmann is given in <The Chess Player>, but he supposedly withdrew after losing a game to Mayerhofer. I suspect he dropped out before even facing Anderssen, since the latter reported all his other games in his magazine. The Mayerhofer–Harrwitz game is on <CG>, but I have yet to discover its provenance. 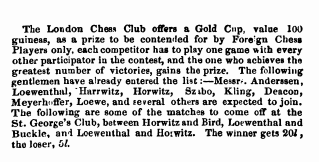 Staunton later wrote scoffingly of Harrwitz’s withdrawal from this tournament, calling Harrwitz a “retreating general” and a “Runaway Apprentice” in <Chess Player’s Chronicle v15 (1854)>. The collection of tournament games is complete insofar as Anderssen is concerned. All his games were published on both sides of the Channel (the only pairing missing is Harrwitz, who I believe forfeited). The fact that Mayerhofer, the second place finisher who happened to be in London studying singing, is 2nd in collection of present-day preserved games is a happy accident – we don’t know his actual score. Nor those of all the other players. In the end the tournament must be viewed as a failure in consequence. It was at the time. Partly this was a result of the failure in planning (it was hastily arranged), in the offering of but one prize, and of scheduling (many players were likely exhausted by the many tournament and match games played). Staunton’s lack of press coverage also contributes to the failure, certainly from our perspective of preserving the record. It is the praise which the author of the pamphlet in question bestows on that shrivelled and exanimate body, whilom the London Chess Club, but now hardly a club at all in numbers, and perhaps rather more a card-playing, than a chess-playing meeting, if the truth were told. We had almost forgotten another encomium bestowed by the pamphleteer on this society, that of having saved the immortal name of British hospitality, by giving cigars and potables to Herr Anderseen and his companions. Well, be it so. The credit of the cigars is entirely due to the London Chess Club: that of the tournament to the St. George’s. This isn’t penned by Staunton, but was published by him. The “credit of the cigars” phrase is entertaining with a little context. One of the incentives offered the players in the London CC tournament, besides the gold Cup, was their offer to supply food, drink, and cigars, at no cost, to the players during play (as mentioned at the end of this SZB notice). club sweepstakes hopefully not be unwelcome. a game against Meyerhofer not mitkämpfen on. Anderssen game, we leave full justice, not surprised us." comparing the Berliner Zeitung Chess (1851 S.308).